Founded by a small group of philosophers over a grey New Jersey weekend in April 2003, the Moral Psychology Research Group fosters collaborative interdisciplinary research on human mentation and morality. Topics on which the group is working include moral reasoning, character, evaluative diversity, moral emotion, positive psychology, moral rules, the neural correlates of ethical judgment, and the attribution of moral responsibility. This work is everywhere informed by contemporary empirical research in the biological, social and behavioral sciences, and is frequently informed by our own empirical work in such areas as development, culture, social cognition, and brain science. A collaboratively authored volume treating these issues, The Moral Psychology Handbook, appeared with Oxford University Press in June 2010. C. Daryl Cameron is an Assistant Professor of social psychology at the University of Iowa. He is also Fellow at the Duke University Kenan Institute for Ethics and a Fellow at the Stanford Center for Compassion and Altruism Research and Education. His research lies at the intersection of psychology and moral philosophy, examining the psychological underpinnings of moral decisions and actions. Fiery Cushman is Assistant Professor of Psychology at Harvard University, where he directs the Moral Psychology Research Laboratory. His research investigates the cognitive mechanisms responsible for human moral judgment, along with their development, evolutionary history and neural basis. His work often draws from classic philosophical dilemmas, and has focused in particular on the psychology of punishment and the aversion to harmful action. He received his BA and PhD from Harvard University, where he also completed a post-doctoral fellowship. He served as Assistant Professor of Cognitive, Linguistic and Psychological Sciences at Brown University from 2011 to 2014. John M. Doris John M. Doris is Professor in the Philosophy–Neuroscience–Psychology Program and Philosophy Department, Washington University in St. Louis. He works at the intersection of cognitive science, moral psychology, and philosophical ethics, authoring or co-authoring papers for such venues as Noûs, Philosophical Studies, Philosophy and Phenomenological Research, Cognition, Bioethics, Journal of Research in Personality, Journal of Experimental Social Psychology , and the Oxford Handbook of Contemporary Philosophy. Doris has been awarded fellowships from Michigan’s Institute for the Humanities, Princeton’s University Center for Human Values, the National Humanities Center, the American Council of Learned Societies, the Center for Advanced Study in the Behavioral Sciences, the National Endowment for the Humanities (three times), and is a winner of the Society for Philosophy and Psychology’s Stanton Prize. He authored Lack of Character: Personality and Moral Behavior (Cambridge, 2002) and Talking to Our Selves: Reflection, Ignorance, and Agency (Oxford 2015). With his colleagues in the Moral Psychology Research Group, he edited The Moral Psychology Handbook (Oxford, 2010). He is presently beginning a collection of his papers, Character Trouble: Undisciplined Essays on Persons and Circumstance , for Oxford University Press. At Washington University, Doris’ pedagogy has been recognized with an Outstanding Mentor Award from the Graduate Student Senate and the David Hadas Teaching Award for excellence in the instruction of first year undergraduates. Jesse Graham received his PhD (Psychology) from the University of Virginia in 2010, a Master's (Religious Studies) from Harvard University in 2002, and a Bachelor's (Psychology) from the University of Chicago in 1998. He is an Assistant Professor of Psychology at the University of Southern California, where he hovers menacingly over the Values, Ideology, and Morality Lab. His research interests are in the moral, ideological, and religious convictions that cause so much conflict and yet provide so much meaning to people's lives. He is particularly interested in how ideological and moral values shape behavior outside of conscious awareness, and in how these effects vary across individuals and cultures. Joshua Greene Joshua Greene is Professor of Psychology, a member of the Center for Brain Science faculty, and the director of the Moral Cognition Lab at Harvard University. He studies the psychology and neuroscience of morality, focusing on the interplay between emotion and reasoning in moral decision-making. His broader interests cluster around the intersection of philosophy, psychology, and neuroscience. He is the author of Moral Tribes: Emotion, Reason, and the Gap Between Us and Them. Gilbert Harman is James S. McDonnell Distinguished University Professor of Philosophy at Princeton University. He is the author or co-author of nine books, including Explaining Values (Oxford, 2000) and (with Sanjeev Kulkarni) Reliable Reasoning (MIT, 2007), and An Elementary Introduction to Statistical Learning Theory (Wiley, 2011). He has edited or co-edited four others, including Conceptions of the Human Mind (Erlbaum, 1993). Daniel Kelly is an associate professor in the Philosophy Department at Purdue University. His research interests are at the intersection of the philosophy of mind, cognitive science, and moral theory. He is the author of Yuck! The Nature and Moral Significance of Disgust, and has published papers on moral judgment, social norms, racial cognition, and cross-cultural diversity. Joshua Knobe is an associate professor of cognitive science and philosophy at Yale University. Most of his research is in the new field of experimental philosophy. In his work in this field, he has conducted experimental studies about people’s intuitions concerning intentional action, causation, consciousness, group agency,racial prejudice, reason, explanation, freedom, and moral responsibility. Above all, he is interested in the ways in which moral considerations can affect people’s judgments about what seem to be purely scientific questions. Victor Kumar is currently a postdoctoral research fellow in the Philosophy Department at the University of Toronto. He was previously a postdoctoral fellow at the University of Michigan from 2013-15. Kumar received his Ph.D. in Philosophy from the University of Arizona in 2013 and was a visiting fellow at Harvard University and Joshua Greene's Moral Cognition Lab in 2011/12. He has published in Ethics, Philosophical Studies, Analysis, and Synthese. His research lies at the intersection of ethics and cognitive science. Edouard Machery Edouard Machery is Professor in the Department of History and Philosophy of Science at the University of Pittsburgh, a Fellow of the Center for Philosophy of Science at the University of Pittsburgh, a member of the Center for the Neural Basis of Cognition (University of Pittsburgh-Carnegie Mellon University), and an Adjunct Research Professor, Institute for Social Research at the University of Michigan. His research focuses on the philosophical issues raised by psychology and cognitive neuroscience with a special interest in concepts, moral psychology, the relevance of evolutionary biology for understanding cognition, modularity, the nature, origins, and ethical significance of prejudiced cognition, the foundation of statistics, and the methods of psychology and cognitive neuroscience. He is also involved in the development of experimental philosophy, having published several noted articles in this field. He is the author of Doing without Concepts (OUP, 2009) as well as the editor of The Oxford Handbook of Compositionality (OUP, 2012), La Philosophie Expérimentale (Vuibert, 2012), Arguing about Human Nature (Routledge, 2013), and Current Controversies in Experimental Philosophy (Routledge, 2014). He is also the editor of the Naturalistic Philosophy section of Philosophy Compass since 2012. Ron Mallon is an associate professor and Director of the Philosophy–Neuroscience–Psychology Program at Washington University in St. Louis. He has authored or co-authored papers in Cognition, Ethics, Journal of Political Philosophy, Midwest Studies in Philosophy, Mind and Language, Nous, Philosophy and Phenomenological Research, Philosophy of Science, Social Neuroscience, Social Philosophy, and Social Theory and Practice. His research is in social philosophy, philosophy of cognitive psychology, and moral psychology. Victoria McGeer is a professor in the Philosophy Department and a Research Scholar in the University Center for Human Values, Princeton University. Alfred Mele is the William H. and Lucyle T. Werkmeister Professor of Philosophy at Florida State University. He is the author of ten books, including Effective Intentions (2009), Backsliding (2012), and Free: Why Science Hasn’t Disproved Free Will (2014), and over 200 articles and the editor or co-editor of six books. He is past director of the Big Questions in Free Will project (2010-13) and current director of the Philosophy and Science of Self-Control project (2014-17) – multi-million dollar projects featuring collaborative research by scientists and philosophers. Mele’s primary philosophical interests are in various aspects of human behavior. Maria Merritt is a Core Faculty member of the Johns Hopkins Berman Institute of Bioethics and Associate Professor in the Department of International Health at the Johns Hopkins Bloomberg School of Public Health in Baltimore, Maryland, USA, with a secondary appointment in the Department of Philosophy at the Johns Hopkins Krieger School of Arts and Sciences. She earned her B.S. in Biology from Wake Forest University, her B.A. in Philosophy and Modern Languages from the University of Oxford, and her Ph.D. in philosophy from the University of California, Berkeley. Merritt completed post-doctoral training in the Department of Bioethics at the National Institutes of Health. Prior to joining the faculty at Johns Hopkins, she taught philosophy at the College of William and Mary and held a Faculty Fellowship at the Edmond J. Safra Foundation Center for Ethics at Harvard University. At Johns Hopkins, Merritt is a faculty affiliate and advisory board member of the Johns Hopkins-Fogarty African Bioethics Training Program. Her current research interests include global health ethics, international research ethics, moral philosophy, and moral psychology. Merritt’s work as an author or co-author includes articles published in AIDS, American Journal of Public Health, Bulletin of the WHO, Ethical Theory and Moral Practice, Ethics, JAMA, Journal of Empirical Research on Human Research Ethics, Journal of Moral Philosophy, Kennedy Institute of Ethics Journal, PLoS Medicine, and Yale Journal of Health Policy, Law, and Ethics. John Mikhail is an Associate Dean of Transnational Legal Study and professor at Georgetown Law. His research interests include tors, criminal law, constitutional law, international law, jurisprudence, moral and legal philosophy, legal history, and law and cognitive science. He received his Ph.D. in Philosophy from Cornell University and was a Lecturer and Research Affiliate in the Department of Brain and Cognitive Sciences at MIT. He received his J.D. from Stanford University. Eddy Nahmias is Professor of Philosophy and an associate member of the Neuroscience Institute at Georgia State University, where he has initiated programs in neurophilosophy and neuroethics. His research is devoted to the study of human agency: what it is, how it is possible, and how it accords with scientific accounts of human nature. His primary focus is the free will debate. He is co-editor of Moral Psychology: Historical and Contemporary Readings. Shaun Nichols holds a joint appointment in philosophy and cognitive science at the University of Arizona. He is author of Sentimental Rules: On the Natural Foundations of Moral Judgment (Oxford, 2004), co-author (with Stephen Stich) of Mindreading: An Integrated Account of Pretense, Self-awareness and Understanding Other Minds (Oxford, 2003), and co-editor (with Joshua Knobe) of Experimental Philosophy (Oxford, 2008). Jonathan Phillips is a postdoctoral fellow in the psychology department at Harvard University. He completed his Ph.D. in philosophy and psychology at Yale in 2015. His research has focuses on the psychological representation of possibilities, moral judgment, causal reasoning and theory of mind. In studying these aspects of cognition and their intersection, he draws on frameworks and tools from philosophy, psychology and linguistics. Alexandra Plakias is a postdoctoral research fellow at the Northern Institute of Philosophy at the University of Aberdeen. Her research concerns moral psychology, metaethics, and the intersection of the two. She has published papers on moral disagreement and moral relativism, and on the role of disgust in moral judgment. Jesse J. Prinz is a Distinguished Professor of Philosophy at the City University of New York, Graduate Center. His research focuses on the perceptual, emotional, and cultural foundations of human psychology. His books include Furnishing the Mind: Concepts and Their Perception Basis (MIT, 2002), Gut Reactions: A Perceptual Theory of Emotion (Oxford, 2004), The Emotional Construction of Morals (Oxford, 2007), Beyond Human Nature (Penguin, 2012), The Conscious Brain (Oxford, in press) and Works of Wonder: A Theory of Art (Oxford, in production). All of his research in the cognitive sciences bears on traditional philosophical questions. Prinz’s work is a contemporary extension of the classical empiricist tradition in philosophy, which emphasizes experience, rather than innate knowledge, and disembodied, amodal representations in thought. Adina Roskies is an Associate Professor of Philosophy at Dartmouth College and has pursued a career in both philosophy and neuroscience. Her research and writing has focused on philosophy of mind, philosophy of science, and ethics, including neuroethics. She received a Ph.D. in neuroscience and cognitive science in 1995 from the University of California, San Diego, and did a post-doctoral fellowship in cognitive neuroimaging at Washington University in St. Louis, using positron emission tomography and functional magnetic resonance imaging (fMRI). After serving two years as senior editor of Neuron, she went on to complete a Ph.D. in philosophy at the Massachusetts Institute of Technology in 2004. Dr. Roskies joined the Dartmouth faculty in the fall of 2004. She has been a visiting fellow in philosophy at the Australian National University and the University of Sydney. She was a project fellow on the MacArthur Law and Neuroscience Project. Her work has been supported by grants and fellowships from National Institutes of Health, the McDonnell–Pew Foundation, and the Mellon Foundation. Dr. Roskies is the author of numerous articles published in academic journals. She was awarded both the William James Prize and the Stanton Prize by the Society of Philosophy and Psychology. Timothy Schroeder received his B.A. from the University of Lethbridge and his Ph.D. from Stanford University. After starting his career at the University of Manitoba, he is now Associate Professor of Philosophy at Ohio State University. He works on the philosophy of mind and moral psychology, and these interests intersect in his book, Three Faces of Desire (Oxford, 2004). He also has a forthcoming book with Nomy Arpaly, In Praise of Desire. Walter Sinnott-Armstrong is Chauncey Stillman Professor of Practical Ethics in the Philosophy Department and the Kenan Institute for Ethics at Duke University. He is also core faculty in the Duke Institute for Brain Sciences and Duke’s Center for Cognitive Neuroscience. He received his BA from Amherst College in 1977 and his Ph.D. from Yale University in 1982. Walter has served as vice-chair of the Board of Officers of the American Philosophical Association and co-director of the MacArthur Project on Law and Neuroscience. He and Felipe De Brigard will organize a series of Summer Seminars in Neuroscience and Philosophy in 2016-2018, funded by the John Templeton Foundation. Walter publishes widely in normative moral theory, meta-ethics, applied ethics, moral psychology and neuroscience, philosophy of law, epistemology, informal logic, and philosophy of religion. He has defended atheism, consequentialism, contrastivism, limited moral skepticism, and irresolvable moral dilemmas. His current research focuses on empirical moral psychology and neuroscience (including experiments on psychopaths and on the diversity of moral judgments) and on the implications of neuroscience for the legal system and for free will and moral responsibility (including the responsibility of addicts and people with mental illnesses, including scrupulosity). David Shoemaker is an associate professor in the Deptartment of Philosophy & Murphy Institute at Tulane University. He is the general editor of Oxford Studies in Agency and Responsibility, and he has published numerous articles on personal identity and ethics, agency and responsibility, and the nature of the moral community. His book Responsibility from the Margins is forthcoming from Oxford University Press. Chandra Sripada is the Co-director of the Neuroimaging Methods Core in the Department of Psychiatry and an Assistant Professor of Philosophy and Psychiatry at the University of Michigan, Ann Arbor. He received his B.A. from the University of Texas, Austin, his M.D. from the University of Texas Medical School, Austin, and his Ph.D. from Rutgers University. Stephen P. Stich is Board of Governors Professor of Philosophy and Cognitive Science at Rutgers University and Honorary Professor of Philosophy at the University of Sheffield. He has written extensively on issues in cognitive science, philosophy of language, philosophy of mind, epistemology, moral theory, and philosophical methodology. Stich is a Fellow of the American Academy of Arts and Sciences and was the first recipient of the American Philosophical Association’s Gittler Award for outstanding scholarly contribution to the philosophy of the social sciences. In 2007, he received the Jean Nicod Prize sponsored by the French Centre National de la Recherche Scientifique. Nina Strohminger is a Postdoctoral Fellow at the Yale School of Management. She has studied morality as it intersects with emotion, identity, and social behavior. Her papers have appeared in Psychological Science, Science, and Cognition. In her free time, Nina hangs out with philosophers. Valerie Tiberius is Professor of Philosophy and Chair at the University of Minnesota. Her work explores the ways in which philosophy and psychology can both contribute to the study of well-being and virtue. She is the author of The Reflective Life: Living Wisely With Our Limits (Oxford 2008), Moral Psychology: A Contemporary Introduction (Routledge 2015) and numerous articles on the topics of practical reasoning, prudential virtues, well-being, and the relationship between psychology and ethics. Kevin Tobia is a graduate student in philosophy (PhD) and law (JD) at Yale. He pursues research in philosophy, law, and cognitive science—most of which is empirically engaged or experimental. He received his BA from Rutgers University and a BPhil (Masters) from Oxford. Manuel R. Vargas is Professor of Philosophy and Law at the University of San Francisco. His work focuses on questions of agency at the intersection morality, psychology, and the law. He also writes about topics in Latin American philosophy. He is the author of Building Better Beings: A Theory of Moral Responsibility, which won the APA Book Prize in 2015. He is also a co-author of Four Views on Free Will, and a co-editor of Rational and Social Agency: The Philosophy of Michael Bratman. Natalia Washington is a McDonnell postdoctoral scholar in the Philosophy Neuroscience and Psychology program at Washington University in St. Louis. Interested in externalist perspectives in philosophy of mind, psychology, and cognitive science, and in understanding the ways in which minds and environments interact, her current research focuses on the theoretic and conceptual foundations of mental health and human nature in the philosophy of psychiatry. She has also done work on implicit bias and moral responsibility, and on the effects of implicit cognition on medical industry interaction with doctors and medical students. Liane Young is Assistant Professor of Psychology at Boston College. She studies the cognitive and neural basis of human moral judgment, focusing especially on the roles of emotion and mental state reasoning. Her work employs the methods of cognitive neuroscience: functional neuroimaging, studying patient populations with specific cognitive and neural deficits, and modulating activity in specific brain areas using transcranial magnetic stimulation. Young received her Ph.D. in psychology from Harvard University in 2008, and her B.A. in Philosophy from Harvard University in 2004. In 2006 Young was awarded the William James Prize by the Society of Philosophy and Psychology for a paper on moral judgment in patients with brain damage. Following are some of our publications in moral psychology since the group's inception in 2003. Doris, J. M., Harman, G., Nichols, S., Prinz, J., Sinnott-Armstrong, W., & Stitch, S. (co-authors/editors). 2010. The Moral Psychology Handbook Oxford: Oxford University Press. Greene, J. (release: Oct. 31, 2013) Moral Tribes: Emotion, Reason, and the Gap Between Us and Them. Penguin Press. Kelly, D. 2011. Yuck! The Nature and Moral Significance of Disgust. Cambridge: MIT Press. Mikhail, J. 2011. Elements of Moral Cognition: Rawls’ Linguistic Analogy and the Cognitive Science of Moral and Legal Judgment. Cambridge: Cambridge University Press. Machery, E. 2009. Doing without Concepts. New York: Oxford University Press. Knobe, J. and Nichols, S. (eds.) 2008. Experimental Philosophy. Oxford: Oxford University Press. Sinnott-Armstrong, W. P. (ed.) 2008. Moral Psychology, Volume 1: The Evolution of Morality. Cambridge: MIT Press. Sinnott-Armstrong, W. P. (ed.) 2008. Moral Psychology, Volume 2: The Cognitive Science of Morality. Cambridge: MIT Press. Sinnott-Armstrong, W. P. (ed.) 2008. Moral Psychology, Volume 3: The Neuroscience of Morality. Cambridge: MIT Press. Tiberius, V. 2008. The Reflective Life: Living Wisely with Our Limits. Oxford: Oxford University Press. Sinnott-Armstrong, W. P. 2006. Moral Skepticisms. New York: Oxford University Press. Nichols, S. 2004. Sentimental Rules: On the Natural Foundations of Moral Judgment. New York: Oxford University Press. Schroeder, T. 2004. Three Faces of Desire. New York: Oxford University Press. Cushman, F. A. (in press). “The Functional Design of Punishment and the Psychology of Learning.” in R. Joyce, K. Sterelny, B. Calcott, & B. Fraser (Eds. ), Signaling, Commitment and Emotion, Vol. 2: Psychological and Environmental Foundations of Cooperation. Cambridge: MIT Press. Cushman, F. A. (in press). “Action, Outcome and Value: A Dual-System Framework for Morality.” Personality and Social Psychology Review. Beall, E., & Graham, J. (in press). Variation and levels of analysis in religion’s evolutionary origins: Comment on Johnson, Li, & Cohen. Religion, Brain, & Behavior. Graham, J. (in press). Explaining away differences in moral judgment: Comment on Gray & Keeney. Social Psychological and Personality Science. Graham, J., Meindl, P., Koleva, S., Iyer, R., & Johnson, K. M. (in press). When values and behavior conflict: Moral pluralism and intrapersonal moral hypocrisy. Social and Personality Psychology Compass. Koleva, S., Beall, E, & Graham, J. (in press) Moral Foundations Theory: Building value through moral pluralism. In A. J. G. Sison (Ed. ), The Handbook of Virtue Ethics in Business and Management. Springer: New York. Scherer, A. M., Windschitl, P. D., & Graham, J. (in press). An ideological house of mirrors: Political stereotypes as exaggerations of motivated social cognition differences. Social Psychological and Personality Science. Waytz, A., Iyer, R., Young, L., & Graham, J. (in press). Ideological differences in the expanse of empathy. In Valdesolo, P. & Graham, J., (Eds. ), Bridging Ideological Divides (Claremont Series on Applied Social Psychology). New York, NY: Taylor and Francis. Wojcik, S., Hovasapian, A., Graham, J., Motyl, M., & Ditto, P. H. (2015). Conservatives report, but liberals display, greater happiness. Science, 347, 1243-1246. Washington, N. and Kelly, D. ‘Who’s Responsible for This? Moral Responsibility, Externalism, and Knowledge about Implicit Bias' to appear in Implicit Bias and Philosophy, Eds. M. Brownstein and J. Saul. Oxford University Press. Holroyd, J. and Kelly, D. 'Implicit Bias, Character and Control’ to appear in From Personality to Virtue: Essays in the Philosophy of Character, Eds. J. Webber and A Masala. Oxford University Press. Kelly, D., and Morar, N. (2014). ‘Against the Yuck Factor: On the Ideal Role of Disgust in Society’ Utilitas, 26(2): 153-177. doi: 10.1017/S0953820813000290. Kelly, D. (2014). ‘Selective Debunking Arguments, Folk Psychology, and Empirical Moral Psychology,' Advances in Experimental Moral Psychology, Eds. Wright, J.C. & Sarkissian, H. New York: Continuum Press, pages 130-147. Graham, J. (2014). Morality beyond the lab. Science, 345, 1242. Koleva, S., Selterman, D., Iyer, R., Ditto, P. H., & Graham, J. (2014). The moral compass of insecurity: Anxious and avoidant attachment predict moral judgment. Social Psychological and Personality Science, 5, 185-194. Jost, J. T., Hawkins, C. B., Nosek, B. A., Hennes, E. P., Stern, C., Gosling, S. D., & Graham, J. (2014). Belief in a just God (and a just society): A system justification perspective on religious ideology. Journal of Theoretical and Philosophical Psychology, 34, 56-81. Meindl, P., & Graham, J. (2014). Know thy participant: The trouble with nomothetic assumptions in moral psychology. In H. Sarkissian and J. C. Wright (Eds. ), Advances in Experimental Moral Psychology (pp. 233-252). London: Bloomsbury. Open Science Collaboration. (2014). The Reproducibility Project: A model of large-scale collaboration for empirical research on reproducibility. In V. Stodden, F. Leisch, & R. Peng (Eds. ), Implementing Reproducible Computational Research (A Volume in The R Series) (pp. 299-323). New York, NY: Taylor & Francis. Stone, S. J., Johnson, K. M., Bell, E., Meindl, P., Smith, B. J., & Graham, J. (2014). Political psychology. Wiley Interdisciplinary Reviews: Cognitive Science, 5, 373-385. Berstein, M. & Kelly, D. 2013. “Minding Animals,” in J. Beever & N. Morar (Eds. ), Perspectives in Bioethics, Science and Public Policy. West Lafayette, IN: Purdue University Press. Cameron, C. D., Payne, B. K., & Doris, J. M. 2013. “Morality in High Definition: Emotion Differentiation Calibrates the Influence of Incidental Disgust on Moral Judgments.” Journal of Experimental Social Psychology 49, 719-725. Cushman, F. A., Sheketoff, R., Wharton, S., & Carey, S. 2013. “The Development of Intent-Based Moral Judgment.” Cognition 127:1, 6-21. Kelly, D. 2013. “Implicit Bias and Social Cognition,” in B. Kaldis (Ed. ), Encyclopedia of Philosophy and the Social Sciences. London: SAGE. Kelly, D. 2013. “Moral Disgust and Tribal Instincts: A Byproduct Hypothesis,” in K. Sterelny, R. Joyce, B. Calcott, & B Fraser (Eds. ), Cooperation and Its Evolution. Cambridge, MA: MIT Press. Mallon, R. 2013. “Was Race Thinking Invented in the Modern West?” Studies in History and Philosophy of Science (Part A) 44(1): 77-88. Dehghani, M., Immordino-Yang, M. H., Graham, J., Marsella, S., Forbus, K., Ginges, J., Tambe, M., & Maheswaran, R. (2013). Computational models of moral perception, conflict, and elevation. In Proceedings of the International Association for Computing and Philosophy (IACAP) 2013, College Park, MD. Graham, J. (2013). Mapping the moral maps: From alternate taxonomies to competing predictions. [Commentary on Janoff-Bulman & Carnes]. Personality and Social Psychology Review, 17, 237-241. Graham, J. (2013). Beyond economic games: A mutualistic approach to the rest of moral life. [Commentary on Baumard, André, & Sperber]. Behavioral and Brain Sciences, 36, 91-92. Iyer, R., Motyl, M., & Graham, J. (2013). What is freedom – and does wealth cause it? [Commentary on Van de Vliert]. Behavioral and Brain Sciences, 36, 492-493. Kim, E., Iyer, R., Graham, J., Chang, Y., & Maheswaran, R. (2013). Moral values from simple game play. In A. M. Greenberg, W. G. Kennedy, & N. D. Bos (Eds. ), Social Computing, Behavioral-Cultural Modeling, and Prediction (pp. 56-64). New York: Springer. Oishi, S., Graham, J., Kesebir, S., & Galinha, I. C. (2013). Concepts of happiness across time and cultures. Personality and Social Psychology Bulletin, 39, 559-577. Cameron, C. D. & Payne, B. K. 2012. “The Cost of Callousness: Regulating Compassion Influences the Moral Self-Concept.” Psychological Science 23: 225-229. Cushman, F. A., Durwin, A. J., & Lively, C. 2012. “Revenge Without Responsibility? Judgments About Collective Punishment in Baseball.” Journal of Experimental Social Psychology 48, 1106-1110. Cushman, F. A., Gray, K., Gaffey, A., & Mendes, W. B. 2012. “Simulating Murder: The Aversion to Harmful Action.” Emotion 12:1, 2-7. Cushman, F. A. & Green, J. D. 2012. “Finding Faults: How Moral Dilemmas Reveal Cognitive Structure.” Social Neuroscience 7:3, 269-279. Dillon, K. D. & Cushman, F. A. 2012. “Agent, Patient…ACTION! What the Dyadic Model Misses. Commentary on Gray et al.” Psychological Inquiry 23:2, 150-154. Doris, J. M. & Nichols, S. 2012. “Broadminded: Sociality and the Cognitive Science of Morality.” In E. Margolis, R. Samuels, and S. Stich (eds. ), The Oxford Handbook of Philosophy of Cognitive Science. Oxford: Oxford University Press. Fessler, D. M. T. & Machery, E. 2012. “Culture and Cognition,” In E. Margolis, R. Samuels, and S. Stich (eds. ), The Oxford Handbook of Philosophy of Cognitive Science. Oxford: Oxford University Press. Harman, G. 2012. “Naturalism in Moral Philosophy.” In S. I. Nuccetelli and G. Seay (eds. ), Ethical Naturalism: Current Debates. Cambridge: Cambridge University Press. Inbar, Y., Pizarro, D. A., & Cushman, F. A. 2012. “Benefitting From Misfortune: When Harmless Actions are Judged to be Morally Blameworthy.” Personality and Social Psychology Bulletin 38:1, 52-62. Machery, E. & Cohen, K. 2012. “An Evidence-Based Study of the Evolutionary Behavioral Sciences.” British Journal for the Philosophy of Science 63(1): 177-226. Mallon, R. & Kelly, D. 2012. “Making Race Out of Nothing: Psychologically Constrained Social Roles,” in H. Kincaid (ed. ), The Oxford Handbook of the Philosophy of Social Sciences. New York: Oxford University Press. Nakao, H. & Machery, E. 2012. “The Evolution of Punishment.” Biology and Philosophy 27(6): 833-850. Rand, D. G., Greene, J. D., & Nowak, M. A. 2012. “Spontaneous Giving and Calculated Greed.” Nature 489: 427-430. Schwitzgebel, E. & Cushman, F. A. 2012. “Expertise in Moral Reasoning? Order Effects on Moral Judgment in Professional Philosophers and Non-Philosophers.” Mind & Language 27:2, 135-153. Strickland, B., Fisher, M., & Knobe, J. 2012. “Moral Structure Falls Out of General Event Structure.”Psychological Inquiry 23: 198-205. Sytsma, J. & Machery, E. 2012. “The Two Sources of Moral Standing.” Review of Philosophy and Psychology 3(3): 303-324. Baumeister, R. F., & Graham, J. (2012). Good and evil, past and future, laboratory and world. In P. Shaver & M. Mikulincer (Eds. ), The Social Psychology of Morality: Exploring the Causes of Good and Evil (pp. 401-412). New York: APA Books. Graham, J., & Iyer, R. (2012). The unbearable vagueness of “essence”: Forty-four clarification questions for Gray, Young, & Waytz. Psychological Inquiry, 23, 162-165. Graham, J., Meindl, P., & Beall, E. (2012). Integrating the streams of morality research: The case of political ideology. Current Directions in Psychological Science, 21, 373-377. Iyer, R., & Graham, J. (2012). Leveraging the wisdom of crowds in a data-rich utopia. [Commentary on Nosek & Bar-Anan]. Psychological Inquiry, 23, 271-273. Koleva, S., Graham, J., Haidt, J., Iyer, R., & Ditto, P. H. (2012). Tracing the threads: How five moral concerns (especially Purity) help explain culture war attitudes. Journal of Research in Personality, 46, 184-194. Cameron, C. D. & Payne, B. K. 2011. “Escaping Affect: How Motivated Emotion Regulation Creates Insensitivity to Mass Suffering.” Journal of Personality and Social Psychology 100:1-15. Cushman, F. A. 2011. “Moral Emotions from the Frog’s Eye View.” Emotion Reviews 3:3, 261-263. Cushman, F. A. & Greene, J. D. 2011. “The Philosopher in the Theater.” In M. Mikulincer & P. R. Shaver (Eds. ), Social Psychology of Morality: The Origins of Good and Evil. APA Press. Cushman, F. A., Murray, D., Gordon-McKeon, S., Wharton, S., & Greene, J. D. 2011. “Judgment Before Principle: Engagement of the Frontoparietal Control Network in Condemning Harms of Omission.” Social Cognitive and Affective Neuroscience. DOI: 10.1093/scan/nsr072. Cushman, F. A. & Young, L. 2011. “Patterns of Moral Judgment Derive from Nonmoral Psychological Representations.” Cognitive Science 35: 1052-1075. Freiman, C. & Nichols, S. 2011. “Is Desert in the Details?” Philosophy and Phenomenological Research 82(1): 121-133. Greene, J. D. 2011. “Social Neuroscience and the Soul’s Last Stand.” In A. Todorov, S. Fiske, & D. Prentice (Eds. ), Social Neuroscience: Toward Understanding the Underpinnings of the Social Mind. Oxford: Oxford University Press. Greene, J. D. 2011. “Morality and Emotion. A Tasting Menu.” Emotion Review 3(3): 1-3. Knobe, J. & Nichols, S. 2011. “Free Will and the Bounds of the Self.” In R. Kane (Ed.) The Oxford Handbook of Free Will. New York: Oxford University Press. p. 530-554. Mallon, R. & Nichols, S. 2011. “Dual Processes and Moral Rules.” Emotion Review 3(3): 284-285. Mikhail, J. 2011. “Emotion, Neuroscience, and Law: A Comment on Darwin and Greene.” Emotion Review 3(3): 293-295. Paxton, J. M., Ungar, L., & Greene, J. D. 2011. “Reflection and Reasoning in Moral Judgment.” Cognitive Science 36: 163-177. Phillips, J., Misenhelmer, L., Knobe, J. 2011. “The Ordinary Concept of Happiness (and others like it).” Emotion Review 3(3):1-3. Phillips, J. & Young, L. 2011. “Apparent Paradoxes in Moral Reasoning; Or How You Forced Him to Do It, Even Though He Wasn’t Forced to Do It.” Proceedings of the Thirty-Third Annual Conference of the Cognitive Science Society. Sarkissian, H., Park, J., Tien, D., Wright, J., & Knobe, J. 2011. “Folk Moral Relativism.” Mind & Language 26: 482-505. Young, L. & Phillips, J. 2011. “The Paradox of Moral Focus.” Cognition 119: 166-178. Bazerman, M. H. & Greene, J. D. 2010. “In Favor of Clear Thinking: Incorporating Moral Rules into Wise Cost-Benefit Analysis.” Perspectives on Psychological Science 5(2): 209-212. Cameron, C. D., Payne, B. K., & Knobe, J. 2010. “Do Theories of Implicit Race Bias Change Moral Judgments?”Social Justice Research 23: 272-289. Doris, J. M. 2010. “Heated Agreement: Lack of Character as Being for the Good.” Philosophical Studies 148: 135-146. Harman, G. 2010. “Words and Pictures in Reports of fMRI Research.” In Hanson, S. J. & Bunzl, M. (eds. ), Foundational Issues in Human Brain Mapping. Cambridge, MA: MIT Press. p. 113-114. Knobe, J. 2010. “Action Trees and Moral Judgment.” Topics in Cognitive Science 2: 555-578. Machery, E., Kelly, D., & Faucher, L. 2010. “On the Alleged Inadequacies of Psychological Explanations of Racism.” Monist 93(2): 228-255. Mallon, R. 2010. “Sources of Racialism.” Journal of Social Philosophy 41(3): 272-292. McGeer, V. 2010. “Co-Reactive Attitudes and the Making of Moral Community.” In C. MacKenzie & R. Langdon (Eds. ), Emotions, Imagination and Moral Reasoning. New York: Psychology Press. Payne, B. K., Hall, D., Cameron, C. D., & Bishara, A. 2010. “A Process Model of Affect Misattribution.” Personality and Social Psychology Bulletin 36: 1397-1408. Shenhav, A. S. & Greene, J. D. 2010. “Moral Judgments Recruit Domain-General Variation Mechanisms to Integrate Representations of Probability and Magnitude.” Neuron 67: 667-677. Glenn, A. L., Koleva, S., Iyer, R., Graham, J., & Ditto, P. H.. (2010). Moral identity in psychopathy. Judgment and Decision Making, 5, 497-505. Graham, J., & Haidt, J. (2010). Beyond beliefs: Religions bind individuals into moral communities. Personality and Social Psychology Review, 14, 140-150. Kesebir, S., Graham, J., & Oishi, S. (2010). A theory of human needs should be human-centered, not animal-centered: Commentary on Kenrick et al. Perspectives on Psychological Science, 5, 315-319. Iyer, R., Graham, J., Koleva, S., Ditto, P. H., & Haidt, J. (2010). Beyond identity politics: Moral psychology and the 2008 Democratic primary. Analysis of Social Issues and Public Policy, 10, 293-306. Nosek, B. A., Graham, J., & Hawkins, C. B. (2010). Implicit political cognition. In B. Gawronski & B. K. Payne (Eds. ), Handbook of Implicit Social Cognition: Measurement, Theory, and Applications (pp. 548-564). New York: Guilford. Cushman, F. A., Dreber, A., Wang, Y., & Costa, J. 2009. “Accidental Outcomes Guide Punishment in a ‘Trembling Hand’ Game.” PLoS One 4(8): e6699.doi:10.1371/journal.pone.0006699. Cushman, F. A. & Macindoe, O. 2009. “The Coevolution of Punishment and Prosociality Among Learning Agents.” In N. A. Taatgen & H. van Rijn (eds. ), Proceedings of the 31st Annual Conference of the Cognitive Science Society. Cushman, F. A. & Young, L. 2009. “The Philosophy of Morality and the Psychology of Dilemmas.” Ethical Theory and Moral Practice 12(1): 9. Doris, J. M. “Skepticism about Persons.” Philosophical Issues 19, Metaethics: 57-91. Greene, J. D. 2009. “Dual-Process Morality and the Personal/Impersonal Distinction: A Reply to McGuire, Langdon, Coltheart, and Mackenzie.” Journal of Experimental Social Psychology 45(3): 581-584. Greene, J. D., Cushman, F. A., Stewart, L. E., Lowenberg, K., Nystrom, L. E., & Cohen, J. D. 2009. “Pushing Moral Buttons: The Interaction Between Personal Force and Intention in Moral Judgment.” Cognition 111(2): 364-371. Greene, J. D. & Paxton, J. M. 2009. “Patterns of Neural Activity Associated with Honest and Dishonest Moral Decisions.” Proceedings of the National Academy of Sciences USA 106(30): 12506-12511. Harman, G. 2009. “Guilt-Free Morality.” Oxford Studies in Metaethics 4: 203-214. Harman, G. 2009. “Skepticism about Character Traits.” Journal of Ethics 13: 235-242. Inbar, Y., Pizarro, D., Knobe, J., & Bloom, P. 2009. “Disgust Sensitivity Predicts Intuitive Disapproval of Gays.” Emotion 9(3): 435-439. Knobe, J. & Roedder, E. 2009. “The Ordinary Concept of Valuing.” Philosophical Issues 19(1): 131-147. Merit, M. 2009. “Aristotelian Virtue and the Interpersonal Aspect of Ethical Character.” Journal of Moral Philosophy 6, 23-49. Pettit, D. & Knobe, J. 2009. “The Pervasive Impact of Moral Judgment.” Mind & Language 24(5): 586-604. Phillips, J. & Knobe, J. 2009. “Moral Judgments and Intuitions about Freedom.” Psychological Inquiry 20: 30-36. Stich, S., Fessler, D., & Kelly, D. 2009. “On the Morality of Harm: A Response to Sousa, Holbrook and Piazza.” Cognition 113(1): 93-97. Vazire, S., and Doris, J. M. 2009. “Personality and Personal Control.” Journal of Research in Personality 43: 274-275. Glenn, A. L., Iyer, R., Graham, J., Koleva, S., & Haidt, J. (2009). Are all types of morality compromised in psychopathy? Journal of Personality Disorders, 23, 384-398. Haidt, J., & Graham, J. (2009). The planet of the Durkheimians, where community, authority and sacredness are foundations of morality. In J. T. Jost, A. C. Kay, & H. Thorisdottir (Eds. ), Social and Psychological Bases of Ideology and System Justification (pp. 371-401). New York: Oxford University Press. Joseph, C., Graham, J., & Haidt, J. (2009). The end of equipotentiality: A moral foundations approach to ideology-attitude links and cognitive complexity. Psychological Inquiry, 20, 172-176. Cushman, F. A. 2008. “Crime and Punishment: Differential Reliance on Causal and Intentional Information for Different Classes of Moral Judgment.”Cognition 108(2): 353-380. Cushman, F. A., Knobe, J., & Sinnott-Armstrong, W. P. 2008. “Moral Judgments Impact Doing/Allowing Judgments.” Cognition 108(1): 281-289. Cushman, F. A. & Mele, A. 2008. “Intentional Action: Two and Half Folk Concepts.” In J. Knobe and S. Nichols (eds. ), Experimental Philosophy. New York: Oxford University Press. Greene, J. D., Morelli, S. A., Lowenberg, K., Nystrom, L. E., Cohen, J. D. 2008. “Cognitive Load Selectively Interferes with Utilitarian Moral Judgment.” Cognition 107: 1144-1154. Griffiths, P. & Machery, E. 2008. “Innateness, Canalization, and ‘Biologicizing the Mind’.” Philosophical Psychology 21(3): 397-414. Hauser, M. D., Young, L., & Cushman, F. A. 2008. “Reviving Rawls’ Linguistic Analogy.” In W. Sinnott-Armstrong (ed. ), Moral Psychology and Biology. New York: Oxford University Press. Kelly, D., Mason, K., & Whitcomb, D. 2008. “Naturalization of Intentionality,” in M. Binder, N. Hirokawa, & U. Windhorst (Eds. ), Encyclopedia of Neuroscience. New York: Springer. p. 1993-1996. Machery, E. 2008. “The Folk Concept of Intentional Action: Philosophical and Experimental Issues.” Mind & Language 23(2): 165-189. McGeer, V. 2008. “Trust, Hope and Empowerment.” Australasian Journal of Philosophy 86(2): 237-254. McGeer, V. 2008. “Varieties of Moral Agency: Lessons from Autism (and Psychopathy).” In W. P. Sinnott-Armstrong (ed.) Moral Psychology Volume 3, The Neuroscience of Morality: Emotion, Disease and Development. Cambridge: MIT Press. McGeer, V. 2008. “The Makings of a Moral Sensibility: Replies to Comments from Jeannette Kennett, Heidi Maibom, and Frederique de Vignemont and Uta Frith.” in W. P. Sinnott-Armstrong (ed.) Moral Psychology Volume 3, The Neuroscience of Morality: Emotion, Disease and Development. Cambridge: MIT Press. Mikhail, J. “The Poverty of the Moral Stimulus.” in W. P. Sinnott-Armstrong (ed.) Moral Psychology Volume 1, The Evolution of Morality: Innateness and Adaptation. Cambridge: MIT Press. Mikhail, J. “Moral Cognition and Computational Theory.” in W. P. Sinnott-Armstrong (ed.) Moral Psychology Volume 3, The Neuroscience of Morality: Emotion, Disease and Development. Cambridge: MIT Press. Nichols, S. 2008. “How Can Psychology Contribute to the Free Will Debate?” In J. Baer, J. Kaufman, & R. Baumeister (eds. ), Psychology and Free Will. New York: Oxford University Press, 10-31. Nichols, S. 2008. “The Rise of Compatibilism: A Case Study in the Quantitative History of Philosophy.”Midwest Studies in Philosophy XXXI. 260-270. Nichols, S. 2008. “Moral Rationalism and Empirical Immunity.” In W. Sinnott-Armstrong (ed. ), Moral Psychology, Volume 2: The Cognitive Science of Morality. Cambridge: MIT Press. 395-407. Nichols, S. & Vargas, M. 2008. “How to Be Fair to Psychopaths.” Philosophy, Psychiatry, and Psychology 14: 153-155. Plakias, A. and Doris, J. M. (co-authors) 2008. “How to Find a Disagreement: Philosophical Diversity and Moral Realism.” In W. Sinnott-Armstrong (ed. ),Moral Psychology, Volume 2: The Cognitive Science of Morality. Cambridge: MIT Press. Sinnott-Armstrong, W. P. 2008. “Abstract + Concrete = Paradox.” In S. Nichols and J. Knobe (eds. ), Experimental Philosophy. New York: Oxford University Press. Sinnott-Armstrong, W. P. & Sosa, E. (eds.) 2008. Interdisciplinary Core Philosophy: Ethics, Philosophical Issues. Tiberius, V. 2008. “The Nativism Debate and Moral Philosophy: Comments on Jesse Prinz, ‘Is Morality Innate?’” In W. Sinnott-Armstrong (ed. ),Moral Psychology, Volume 1: The Evolution of Morality. Cambridge: MIT Press. Graham, J., Haidt, J., & Rimm-Kaufman, S. E. (2008). Ideology and intuition in moral education. European Journal of Developmental Science, 2, 269-286. Doris, J. M., & Murphy, D. (co-authors) 2007. “From My Lai to Abu Ghraib: The Moral Psychology of Atrocity.” Midwest Studies in Philosophy 31:25-50. Greene, J. D. 2007. “Why are vmPFC Patients More Utilitarian? : A Dual-Process Theory of Moral Judgment Explains.” Trends in Cognitive Sciences 11(8): 322-323. Knobe, J. 2007. “Experimental Philosophy and Philosophical Significance.” Philosophical Explorations 10, 119-122. Knobe, J. 2007. “Folk Psychology: Science and Morals.” In Hutto, D. & Ratcliffe, M. (eds) Folk Psychology Reassessed. Kluwer/Springer Press. 157-174. Knobe, J. & Leiter, B. 2007. “The Case for Nietzschean Moral Psychology.” In B. Leiter & N. Sinhababu (Eds.) Nietzsche and Morality. Oxford: Oxford University Press. p. 83-109. Koenigs, M., Young, L., Adolphs, R., Tranel, D., Cushman, F. A., Hauser, M. D., & Damasio, A. 2007. “Damage to Ventromedial Prefrontal Cortex Increases Utilitarian Moral Judgments.” Nature 446: 908-911. McClure, S. M., Botvinick, M. M., Yeung, N., Greene, J. D., & Cohen, J. D. 2007. “Conflict Monitoring in Conflict-Emotion Competition.” In J. J. Gross (ed. ), Handbook of Emotion Regulation. New York: Guilford Press. Mele, A. & Cushman, F. A. 2007. “Intentional Action, Folk Judgments and Stories: Sorting Things Out.” Midwest Studies in Philosophy 31(1): 184-201. Nichols, S. 2007. “After Incompatibilism: A Naturalistic Defense of the Reactive Attitudes.” Philosophical Perspectives 21, 405-428. Nichols, S. 2007. “On the Psychological Diversity of Moral Insensitivity.” In O. Vilarroya and L. Valencia (eds. ), Biology of Conflicts and Cooperation. Barcelona: Littera Ediciones. Young, L., Cushman, F. A., Hauser, M. D., & Saxe, R. 2007. “Brain Regions For Belief Attribution Drive Moral Condemnation for Crimes of Attempt.”Proceedings of the National Academy of Science 104(20): 8235-8240. Cushman, F. A., Young, L., & Hauser, M. D. 2006. “The Psychology of Justice: A Review of Natural Justice by Kenneth Binmore.” Analyse & Kritik 28:95-98. Cushman, F. A., Young, L., & Hauser, M. D. 2006. “The Role of Reasoning and Intuition in Moral Judgments: Testing Three Principles of Harm.”Psychological Science 17(12): 1082-1089. Doris, J. M. 2006. “Out of Character: On the Psychology of Excuses in the Criminal Law.” In H. La Follette (ed. ), Ethics in Practice (3rd edn.) Oxford: Blackwell Publishing. Kelly, D., Machery, E., Mallon, R., Mason, K., & Stich, S. 2006. “The Role of Psychology in the Study of Culture.” Behavioral and Brain Sciences 29(4): 355. Knobe, J. and Burra, A. 2006. “Intention and Intentional Action: A Cross-Cultural Study.” Journal of Culture and Cognition 6: 113-132. Knobe, J. and Burra, A. 2006. “Experimental Philosophy and Folk Concepts: Methodological Considerations.”Journal of Cognition and Culture 6: 331-342. Knobe, J., Olum, K., & Vilenkin, A. 2006. “Philosophical Implications of Inflationary Cosmology.” British Journal for the Philosophy of Science 57: 47-67. Knobe, J. & Roedder, E. 2006. “The Concept of Valuing: Empirical Studies.” Online Philosophy Conference. Sinnott-Armstrong, W. P. 2006. “Moral Intuitionism Meets Empirical Psychology.” In T. Horgan and M. Timmons (eds. ), Metaethics After Moore. New York: Oxford University Press. p. 339-365. Woolfolk, R. L., Doris, J. M., & J. M. Darley. 2006. “Identification, Situational Constraint, and Social Cognition: Studies in the Attribution of Moral Responsibility.” Cognition 100: 283-301. Young, L., Cushman, F. A., Adolphs, R., Tranel, D., & Hauser, M. D. 2006. “Does Emotion Mediate the Relationship Between an Action’s Moral Status and Its Intentional Status? Neuropsychological Evidence.” Journal of Culture and Cognition 6(1-2): 291-304. Graham, J. (2006). Research summary of the Uncle Dan’s Report Card pilot study. Report for Kansas Governor Sebelius on a possible statewide moral education program. Doris, J. M. 2005. “Précis” and “Replies: Evidence and Sensibility.” Philosophy and Phenomenological Research 72: 632-635, 656-677. Doris, J. M. & Stich, S. P. 2005. “As a Matter of Fact: Empirical Perspectives on Ethics.” In F. Jackson and M. Smith (eds. ), The Oxford Handbook of Contemporary Philosophy. Oxford: Oxford University Press. Greene, J. D. 2005. “Cognitive Neuroscience and the Structure of the Moral Mind.” In S. Laurence, P. Carruthers, and S. Stich (eds. ), The Innate Mind: Structure and Contents. New York: Oxford University Press. Greene, J. D. 2005. “Emotion and Cognition in Moral Judgment: Evidence from Neuroimaging.” In J. P. Changeux, A. R. Damasio, W. Singer, & Y. Christen (eds.) Neurobiology of Human Values. Berlin: Spring-Verlag. Harman, G. 2005. “Moral Particularism and Transduction.” Philosophical Issues 15: 44-55. Knobe, J. 2005. “Ordinary Ethical Reasoning and the Ideal of ‘Being Yourself.’” Philosophical Psychology 18: 327-340. Machery, E. 2005. “You Don’t Know How You Think: Introspection and Language of Thought.” The British Journal for the Philosophy of Science 56: 469-485. Machery, E. & Faucher, L. 2005. “Social Construction and the Concept of Race.” Philosophy of Science 72: 1208-1219. Machery, E. & Faucher, L. 2005. “Why Do We Think Racially?” In H. Cohen and C. Lefebvre (eds. ), Handbook of Categorization in Cognitive Science. Elsevier. 1009-1033. Machery, E., Kelly, D., & Stich, S. P. 2005. “Moral Realism and Cross-Cultural Normative Diversity: Comment on Henrich et al.” Behavioral and Brain Sciences 28: 830. McGeer, V. 2005. “Out of the Mouths of Autistics: Subject Report and Its Role in Cognitive Theorising.” in A. Brook & K. Akins (eds.) Cognition and the Brain: The Philosophy and Neuroscience Movement. Cambridge: Cambridge University Press. Nichols, S. 2005. “Innateness and Moral Psychology.” In P. Carruthers, S. Laurence, & S. Stich (eds. ), The Innate Mind: Structure and Content. New York: Oxford University Press. 353-369. Schroeder, T. 2005. “Moral Responsibility and Tourette Syndrome.” Philosophy and Phenomenological Research 71, 106-123. Sinnott-Armstrong, W. P. 2005. “You Ought to be Ashamed of Yourself (When You Violate an Imperfect Moral Obligation).” Philosophical Issues 15 (Normativity): 193-208. Stevens, J. R., Cushman, F. A., & Hauser, M. D. 2005. “Evolving the Psychological Mechanisms for Cooperation.” Annual Review of Ecology and Systematics 36:499-518. Graham, J. (2005). From sea battles to string puppets: Leviathan, creation and theodicy in the book of Job. Amalgam: The Virginia Interdisciplinary Review, 1, 15-25. Greene, J. D. & Cohen J. D. 2004. “For the Law, Neuroscience Changes Nothing and Everything.” Philosophical Transactions of the Royal Society of London B (Special Issue on Law and the Brain) 359: 1775-1785. Greene, J. D., Nystrom, L. E., Engell, A. D., Darley, J. M., & Cohen, J. D. 2004. “The Neural Bases of Cognitive Conflict and Control in Moral Judgment.” Neuron 44:389-400. Harman, G. 2004. “Practical Aspects of Theoretical Rationality.” In A. Mele and P. Rawling (eds. ), The Oxford Handbook of Rationality. Oxford: Oxford University Press. pp. 45-56. Hulse, D., Read, C. N., & Schroeder, T. 2004. “The Impossibility of Conscious Desire.” American Philosophical Quarterly 41: 73-80. Knobe, J. 2004. “What is Experimental Philosophy.” The Philosophers’ Magazine 28. Knobe, J. 2004. “Intention, Intentional Action, and Moral Considerations.” Analysis 64:181-187. Knobe, J. 2004. “Folk Psychology and Folk Morality: Response to Critics.” Journal of Theoretical and Philosophical Psychology 24. Knobe, J. & Mendlow, G. 2004. “The Good, the Bad, and the Blameworthy: Understanding the Role of Evaluative Reasoning in Folk Psychology.” Journal of Theoretical and Philosophical Psychology 24: 252-258. Mallon, R. 2004. “Passing, Traveling, and Reality: Social Construction and the Metaphysics of Race.” Nous 38(4): 644-673. McGeer, V. 2004. “Autistic Self-Awareness.” Philosophy, Psychiatry and Psychology 11(3): 235-251. Nichols, S. 2004. “After Objectivity: An Empirical Study of Moral Judgment.” Philosophical Psychology 17: 5-28. Tiberius, V. 2004. “Cultural Differences and Philosophical Accounts of Well-Being.” Journal of Happiness Studies 5: 293-314. Gerrans, P. & McGeer, V. 2003. “Theory of Mind in Autism and Schizophrenia.” in E. Rapacholi & V. Slaughter (eds.) Individual Differences in Theory of Mind: Implications for Typical and Atypical Development. Brighton: Psychology Press. Greene, J. D. 2003. “From Neural ‘is’ to Moral ‘Ought’: What Are the Moral Implications of Neuroscientifc Moral Psychology?” Nature Reviews Neuroscience 4: 847-850. Harman, G. 2003. “Three Trends in Moral and Political Philosophy.” The Journal of Value Inquiry 37: 415-425. Greene, J. D. & Haidt, J. 2002. “How (and Where) Does Moral Judgment Work?” Trends in Cognitive Sciences 6(12): 517-523. Greene, J. D. & Baron, J. 2001. “Intuitions About Declining Marginal Utility.” Journal of Behavioral Decision Making 14: 243-255. Following are syllabi for interdisciplinary courses in moral psychology. We hope this will serve as a resource for those teaching in the area. Graham, J., USC, syllabi for five corses: Ideology and Morality, Formation and Change of Attitudes, The Science of Happiness, Moral, Political, and Religious Conviction, and Empirical Approaches to the Meaning of Life. 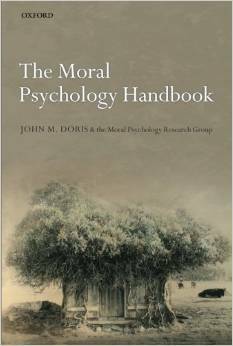 John M. Doris and the Moral Psychology Research Group. The Moral Psychology Handbook. Oxford: Oxford University Press, 2010. Order Online here or here. For a review, check Notre Dame Philosophical Review.